The first stage of any concept is rarely pretty. Staring at a blank canvas at the start of a writing or creative project is daunting, and the first attempts at clarifying the scope of what you’re trying to accomplish and how you’re going to get there usually end up in the trash or wiped off a white board. Creative Mornings, a monthly lecture series for the creative community, embraced this concept of “ugly” for January’s talk. Graphic designer Nikki Villagomez (@nikki_vz) joined the Cleveland chapter of Creative Mornings for her take on the theme. For 15 years, Villagomez has built a successful career in graphic design and as a nationally recognized speaker on typography. She’s currently the Graphic Design + Creative Studio Manager at Dixon Hughes Goodman LLP and runs the blog Culture+Typography. 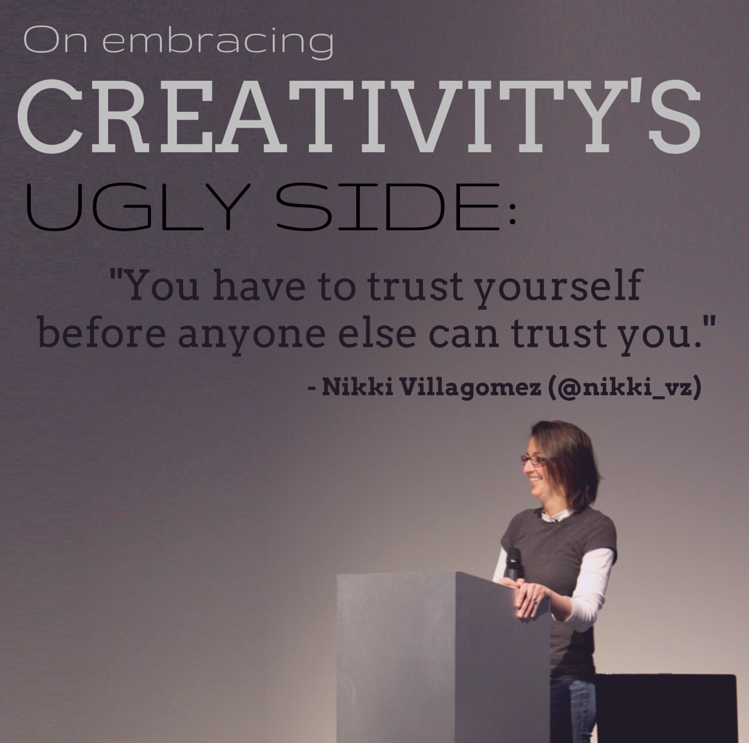 In her talk “The good, the bad, and the (not so) ugly,” she shared the lessons she’s learned. 1. Set goals (both short-term and long-term). Short-term goals are more fluid and can be adapted more quickly as assignments or circumstances change. Long-term goals should be evaluated yearly. 2. Work on projects you are passionate about. It’s important to have a passion for both the project you’re working on and the people you are working with. Find and work for people who understand the value that you bring to the table. 3. Learn from your failures. 5. You have to trust yourself before anyone else can trust you. Villagomez says that was one of her early goals when she started her public speaking career. “If I didn’t trust myself or what I was saying, the audience wouldn’t trust me or see me as credible,” she said. 6. Find out who you are and never let go. Envision a white wall and decide what you would use to fill that space by answering these questions: Who am I? With whom do I identify? Give yourself permission to identify with bits and pieces of a lot of things, because it’s all part of who you are. 7. Don’t be afraid of the unknown. Embrace curiosity. Facing a blank canvas or white wall is scary, but even if the first draft is really ugly, you’ve taken a step into the unknown. Getting past the fear and following where that draft takes you is such an important part of the process. In the end, the ugly is what gets us to the finished product. To find out more about Creative Mornings, visit http://www.creativemornings.com. Catherine Spicer is a manager of customer content services at PR Newswire and our resident Grammar Hammer.